Form: Simple and ready-to-cook peeled shrimp, just thaw them and they are ready for the pan. Without the tail, they are just pure goodness. With the tail piece left on, you have the perfect decorative form for cocktails, scampi, or any of a wide range of beautiful center-of-the-plate concepts! 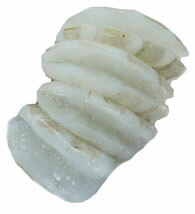 EZ Peel Shrimp are raw and deveined, but the shell stays on with a big slice along the back. Leave the shell on to draw out the flavor in a shrimp boil or on the grill, but the shell “peels easy” whenever you want! EZ Peels are popular because of their versatility. They are very common in both foodservice and retail usage. Beautiful Black Tiger Shrimp, plucked from the water in pristine condition and presented whole. Each piece is a feast for the eyes and delicious too.